President Uhuru Kenyatta (left) and his deputy William Ruto attend musician Joseph Kamaru's burial in Murang'a (file photo). Kasarani — Deputy President William Ruto has asked Jubilee supporters not to panic over the current state of political affairs. Ruto said what was being witnessed in the party was a passing cloud that should not worry supporters. "We should relax. No need to worry as we are on the right track as a party in implementing our development agenda for Kenyans," said Ruto. Responding to some leaders who had expressed concern over wrangles in the Jubilee Party occasioned by the National Super Alliance (NASA), the Deputy President assured Kenyans that the leadership of the ruling coalition was intact. "We are firm and clear in our focus as we know where we are going," said Ruto at PCEA, Mwiki in Nairobi on Sunday. The leaders present told former Prime Minister Raila Odinga and ODM MPs to first sort out the mess in NASA before poking their nose in Jubilee affairs. "Those lecturing us in Jubilee on development should first sort out the mess in NASA. The Opposition is in tatters and should stop importing their confusion to the Jubilee Party," said Ruto. The 10 MPs and Governor Ferdinand Waititu said the Opposition was scheming to sabotage the Jubilee agenda with eyes on 2022 politics. The leaders said the Opposition was now using the Raila-Uhuru Kenyatta handshake to cause confusion and political storm in the ruling party, thus undermining the implementation of the Big Four agenda of manufacturing, housing, food security and healthcare. The MPs were Kimani Ichungwah (Kikuyu), Jeremiah Kioni (Ndaragwa), John Kiarie (Dagoretti South), Charles Kanyi (Starehe), Aisha Jumwa (Malindi), Kimani Ngunjiri (Bahati), Jungle Wainaina (Thika Town) and Benjamin Mwangi (Embakasi Central). They said the Opposition has come up with the 'corruption narrative' to tarnish the image of the Jubilee Party ahead of the 2022 General Election. "In fact, they (Opposition) have told President Uhuru Kenyatta to abandon the implementation of the Big Four agenda and focus on corruption and Deputy President William Ruto. This is all about 2022 politics," said Ichungwah. He added: "But the Big Four agenda has been hijacked by the Opposition whose focus is now on 2022 politics." Ngunjiri said the handshake should not be used to fight or undermine the Deputy President. Kanyi and Kiarie said they would not allow those in Opposition to use the handshake to undermine the leadership of the Jubilee Party. Kiarie said development should be carried out alongside the fight against corruption. "We should not abandon initiation of development projects simply because we are fighting corruption," said Kiarie. Governor Waititu told Odinga to first clear his name over the disappearance of Sh3.5 billion under the then Kazi Kwa Vijana program that was under his watch when he was Prime Minister. "Raila Odinga should first tell Kenyans about the misappropriation of the Kazi Kwa Vijana funds and the maize scandal issues before pointing fingers on others on matters of corruption," said Waititu. The governor told Jubilee to be cautious while dealing with the Opposition leader, saying his history of destroying political parties was clear. "We know that Raila Odinga destroyed KANU, NARC and now NASA. We should not entertain him if our Jubilee agenda for Kenya is to be implemented," said Governor Waititu. Jumwa said Jubilee competitors were unfairly criticizing the Deputy President because of 2022 politics. "Some people want to tarnish your image through fake things like corruption because of 2022 politics. Don't bother with them. They will be ashamed of their deeds because Kenyans know development conscious leaders," said Jumwa. She said she was confident that President Kenyatta would support the Deputy President in 2022. The leaders said voters in Central and Mt Kenya will back the Deputy President for the top seat in 2022. "We want to make it clear that as people from Mt Kenya, we are not political conmen. We promised in 2013 that we support President Kenyatta for 10 years and Mr Ruto for another 10 years. Our agreement still stands," said Governor Waititu. Mwangi told leaders who lost their seats in 2017 to stop directing their anger at the Deputy President, saying it was the voters who made the decisions. "I will stand with Mr Ruto in 2022 come rains come sunshine. 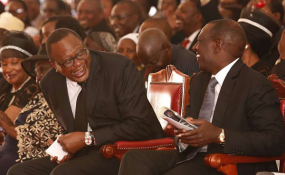 I better lose my seat so long my brother Ruto becomes the President of Kenya," said Mwangi. Kanyi told off Nominated MP Maina Kamanda and former MPs including Dennis Waweru (former Dagoretti South MP) for their spirited efforts to block the Deputy President from taking over the leadership of the country in 2022.